The Dahle 40430 Office Shredder is designed to accommodate the needs of most busy offices that shred between 400 and 2,000 sheets per day. With a 10 1/4” feed opening, #20 paper capacity of 9 sheets at a time, and a shred size of 1/32" x 7/16", this cross cut shredder is ideal for shredding personnel records, tax documentation, health records, or any other confidential information. Dimensions (h x w x d) 36 3/4" x 21 1/2" x 17 1/2"
With the widespread use of network printers and fax machines, confidential business information is constantly being printed throughout the workday, it’s important to have a powerful shredder located nearby to easily dispose of this information. 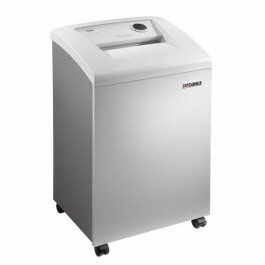 The Dahle 40430 Office Shredder is designed to accommodate the needs of most busy offices. With a 10 1/4” feed opening, #20 paper capacity of 9 sheets at a time, and a shred size of 1/32" x 7/16", this cross cut shredder is ideal for shredding personnel records, tax documentation, health records, or any other confidential information. The Dahle 40430 Office Shredder also offers features important for employee safety and ease of use including Automatic Shutoff when the cabinet door is open, Auto Reverse to prevent an over­feed, automatic On/Off and Bag Full Auto Off. Quiet operation and power management are also hallmarks of Dahle Office Shredders. Each cutting cylinder is encased in an all-steel frame and sits on rubber shock mounts, reducing vibration through the cabinet producing whisper quiet op­eration. Our revolutionary SmartPower Energy Man­agement System saves energy by using a multi-stage system that re­duces power consumption after ten minutes of sitting idle (sleep mode), and completely powers down after an additional 20 minutes of inactivity. Dahle’s shredders are German Engineered using the latest technology and finest ma­terials, ensuring peace of mind in knowing your Dahle shredder will provide many years of trouble free operation.